NOTE: If you have horses you want to either leave them in another town, or make sure to leave the same way you came, because once you leave the tower after killing the Haaki it will disappear, taking your horses with it if you left them there. 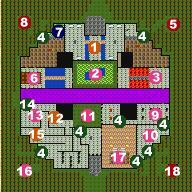 Upon first entering the tower, which can only be entered from the north, you'll find yourself in a room with 6 pools. Starting in the far northeast corner and working your way clockwise to the far northwest corner the pools do the following: Improve Gymnastics, but can only be used once; Drains Experience; Gives 100 spell points; Does nothing; Covers you with acid; and Recover hit points. Once you've used any of the pools you want or need to, go through the door to the south to fight some Shamblers. Head out of the Shambler room to the east and you'll find a bridge over some lava. On the other side of the bridge are some Gazers. Gazers are a bit of a pain in that they drain your spell points, starting with your Mage(s) and then moving on to your Priest(s). Once you've killed the Gazers go through the door just behind where they were standing that leads to the north. There's a force barrier here, which you'll have to take down, guarding a body which has a Cursed Robe on it. There's a secret passage just to the north of where the barrier was. Going through the secret passages to outside the Tower will always put you in what appears to be a small space blocked completely by trees. In each of the four corners one of these trees you will be able to walk through, but I'll leave it up to you to discover which one. Each of the four corners has a small hut beside the trees, and for the other three I'll only be specifying what's in the hut. This hut contains the Summon Aid Spellshard. Go back into where you fought the Gazers now, and take the door to the south. You'll find yourself in a long hallway running east/west, with a door at each end leading north, and a door at the east end going south. For now head down to the west side and go north again. This room has a couple Rakshasa's. Rakshasa are even worse than the Gazers, because they do a fair amount of magical damage, unless your resistance is very high, and magical damage doesn't affect them at all, except for the spell Cloud of Blades, which is more a physical attack than a magical one. Once you've killed the Rakshasa's head through the door to the north to find a mirror image of the room in the northeast corner, except that this room contains a friendly Tame Fungus, and the secret passage is slightly to the south of the barrier. The hut in this corner contains a wand and an augmented fine leather helmet that provides +10% Resistance to Acid. Now go back into the long east/west hallway and go back to the east side and through the door to the south. There's some Vile Imps and Imps in this room. There are two secret passages off of this room, one in the southeast corner, which leads to a room with a couple Guardians, and one in the southwest corner which leads to some Spine Beasts. To get the southern room out of the way first, enter through the secret passage and watch the webs to try to track the Guardians. Once you've killed both of them go through a secret passage in the southeast of the room, near the tip of the inverted triangle the room looks like on the map. Unfortunately, you can't reach the hut through here, due to a sign blocking your way. So head back to the room where you fought the Vile Imps and Imps and take the second secret entrance out. Once you've killed the Spine Beasts go through the passage to the west. It's blocked by two Fire Barriers, which you can either walk through or dispel using Dispel Barrier or a Piercing Crystal. When you get to the first curve in this hallway you're going to trigger a Quickfire trap, so move as quickly as you can to where the rune is shown on the map. This rune will cause the air to freeze for a moment, thereby extinguishing the quickfire. However, you're going to run into at least one Imp or Vile Imp on your way to the rune, because these halls have the creatures through their entire length. It's also worth noting that there's a cracked section of wall in the northwest of this section of the tower that you can take down if you want. There's another secret passage exactly opposite the one you went through in the room with the Guardians. The hut in this corner contains nothing but an Ur-Basilisk. The stone man right outside the hut was a pretty good clue. Finish making your way through the hall with the Vile Imps and the Imps until you get to the northeast corner of the hall. There's yet another secret passage here, this one leading to the exit from the Fading Tower, but you don't want to leave just yet. Go over one more room, to the far southesatern corner of the tower. This is the heart of the Tower, and you'll find a Haakai and a couple Shamblers standing on the platform at the south end of the room. Unfortunately, you can't reach the platform, and the Haakai isn't going to move, so you'll have to use distance attacks to kill it. Once you've killed the Haakai check the eastern wall of this room, making your way around the room while hugging the walls to avoid the barrier that keeps you from the platform. There's a secret passage just a little bit north of the far southeastern corner. This lets you get to the hut you couldn't reach from the room with the Guardians, and it contains the Bloodthirst Spear.